Globe’s Use of “Tonino Lamborghini” Unauthorized? Someone has called my attention to a press release posted on the newswire service Marketwire entitled “4G Tatto Tonino Lamborghini Broadband Stick Is a Fake!”. 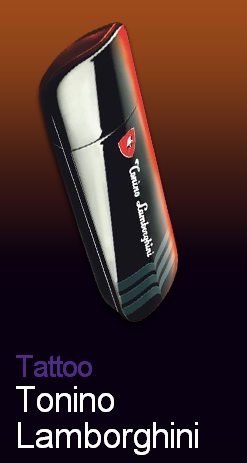 The press release claims that Tonino Lamborghini has not authorized Globe Telecom to use its name for the internet dongle Tattoo Tonino Lamborghini. BOLOGNA,ITALY–(Marketwire – Aug. 23, 2011) – Tonino Lamborghini s.r.l., an Italy-based company which is the sole lawful owner worldwide of the trademark “Tonino Lamborghini” hereunder wishes to inform its customers that unauthorized people are currently trading online and through Globe stores a “4G Tatto Tonino Lamborghini” broadband stick which is a counterfeited product. Tonino Lamborghini s.r.l. has never manufactured or authorized anyone to manufacture such a product which constitutes therefore a serious trademark infringement. Moreover the advertising campaign “Feed your need for speed” featuring Marlon Stockinger, first Filipino to win a formula race inEurope, is deceitful and unlawful since it leads to a serious likelihood of confusion between two different and separate brands and businesses that is to say “Tonino Lamborghini” and “Automobili Lamborghini”. Tonino Lamborghini s.r.l. shall take any legal action to protect the brand. Could this be true? The Press Release is issued by Tonino Lamborghini s.r.l. and under the name of the CEO Gian Luca Filippi. Let’s wait for Globe Telecom’s comment on this matter.